In the Volga delta we stayed in Damtschik in the south-western part of the delta. Damtschik is a small fishermen village with some scientific facilities and some scientific staff. The daily routine in Damtschik in the 4 days looked started with getting-up, of course. Get up at 5:45; then briefly balancing on wooden planks for breakfast. After breakfast we explored the various habitats of the delta in 2 boats. From time to time we ventured out for excursions ashore. Ornithologically, the most productive area is the so-called cultuk zone of the avandelta. For lunch, we headed back to Damtschik. The food was all the time very tasty, plentiful and rich. After a short siesta, we usually started at 3:00 pm again with the boats. Flying over Damtschik we observed dozens of Great Cormorants (Phalacrocorax carbo) and herons – Little Egret (Egretta garzetta) , Grey Heron (Ardea cinerea), Purple Heron (Ardea purpurea) , Squacco Heron (Ardeola ralloides), Black-crowned Night-Heron (Nycticorax nycticorax) each morning. It was near Damtschik, when I observed the first Ruddy Shelduck (Tadorna ferruginea) in the wild. At a time when these geese were not to be seen as invasive species in Middle Europe. The highlight, however, are the rare Dalmatian Pelicans (Pelecanus crispus). Especially the breakfast excursion was often very productive. 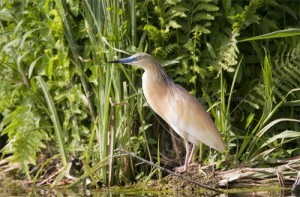 So you see even a singing Great Reed Warbler (Acrocephalus arundinaceus) or a Roller (Coracias garrulus). Again and again flying Glossy Ibis were seen (Plegadis falcinellus) above us. The morning boat tour usually led down the river which is lined with silver willows and reeds. After about 1 hour the so-called Avandelta is reached. On the way we met several White-tailed Eagle (Haliaeetus albicilla), Great Cormorants (Phalacrocorax carbo) and Grey Heron (Ardea cinerea), Purple Heron (Ardea purpurea) and Squacco Heron (Ardeola ralloides). Where the channels and various streams widen to the lake-like Avandelta Whiskered Tern (Chlidonias hybridus) and Black Tern (Chlidonias niger) show-up flying low over water lilies. White-winged Tern (Chlidonias leucopterus) is only to be seen earlier in the year on migration. The species spectrum corresponds more or less to that which you get to see even in birds in the Danube Delta in May. High tides and steady northeast wind which pushes the water of the Caspian Sea from the delta ensure that wide mudflats are exposed at the edge of the Avandelta. Peaceful coves, dried reeds and cattails determine the image of the landscape. It seems that the number of bird species observed is strongly dependent on the water level. Especially at the beginning of the tour, in the second week of May we had some great observations in the Avandelta because the mudflats were unusually well developed. Due to the unusual cold temperatures in the weeks before the vegetation was back 2-3 weeks and the water level was relatively low. On the downside was the fact, that there were only a few warblers and not a single Little Bittern (Ixobrychus minutus). But on the mudflats many birds rested – especially waders. Excellent observations were possible of Spotted Redshank (Tringa erythropus), Little Stint (Calidris minuta), Temminck’s Stint (Calidris temminckii), Dunlins (Calidris alpina) and Ruffs (Philo pugnax). A Lifer for many members of the party was the Terek Sandpiper (Xenus cinereus), which was sighted in the first days. After the first few days, the water level rose rapidly. The reason was the warmer weather which caused meltwater flowing in the Delta. In addition, there was a fairly strong, somewhat unpleasant southeast wind, which drove the waters of the Caspian Sea in the delta. The open mudspaces in the Avandelta were quickly flooded and the resting birds disappeared. In particular, resting waders were forced to move to the north. When the rising Volga water has flooded the meadows, there is a new peak in birding. These spawn lots of fish; especially wild carp and White-tailed Eagle appear in large numbers on the flooded meadows to hunt for the fish. An extra of the trip was the observation of a single, male Rufous-tailed Rock-Thrush (Monticola saxatilis), which was spotted at the very start of the journey near Damtschik on a dirt road. For the local Russian ornithologists this was a lifer for this area, too. The daily schedule usually ended when the sun disappears at 7:15 pm. Then the tour group should be back for dinner. After dinner the last task was to update the day – species list. The evening ended normally with well deserved vodka. Even at this time bird-lens.com was interested to shoot pictures of birds in the Western Palearctic .To cope with the growing demand for top shots of the rarer species of the Palearctic Bird-Lens is keen to enrich the range of pictures of birds you can find in the western Palearctic furthermore. The image you find in the blog is only a first impression, what you will find in the gallery in the “Pictures Shop” very soon. Just give me a message, if I could serve you with an image needed before the new pictures are online. Thank you for this interesting trip report. I am planning a trip to the Volga Delta this year. Do you have contact details of local english speaking guides in the delta? I have contacted Eco Travel Centre in Russia, but their proposed trip is very expensive. I would like to make my own arrangements. If you have any tips of local places to stay and of local guides, that would be very welcome!